For this second post in the series on bières de coupage, I'm going to survey some contemporary examples of such beers. I contacted a number of breweries while writing this post, and I've included any information they provided below. The selection of beers is far from exhaustive, and I'll continue to update this post with new beers, along with any more information I manage to uncover about the ones I've included. I'll advertise any updates on this blog's Facebook page. Besides the breweries themselves, some information in this post was provided by Dave Janssen of Hors Catégorie Brewing, and Andrew Addkison of The Farmhouse Obsession. 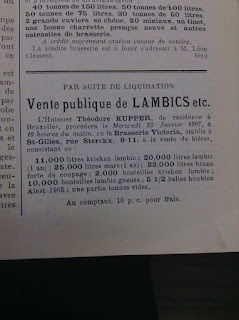 As we saw in the first post in this series, merchants and blenders have long been able to buy lambic in bulk from lambic breweries for making their own blends. At the time Laurent was writing, this would generally have been for producing faro. (Laurent does not mention gueuze, probably because he was writing before the glass bottles essential to the refermentation of gueuze were widely available). Its worth flagging how this practice differs from that of modern blenders such as Tilquin and Hanssens, who purchase wort rather than lambic, and ferment and age it in their own barrels. A few of the things I've read suggest that this wouldn't have been unheard of in the eighteenth and nineteenth century—a response to one letter published in Le Petit Journal du Brasseur suggested purchasing wheat beers from regions outside Brussels and aging them in casks as a cheaper alternative to purchasing lambic—but most of the material is about people buying lambic rather than wort. Today's home-blenders, along with breweries wanting to blend their own beers with genuine lambic, depend on sale of this sort, whether it be the small quantities involved bag-in-a-box lambic, or the larger volumes required for commercial blending. Such blends provide some of the best examples of modern bière de coupage, most being made by European breweries. Perhaps the best place to start in surveying these beers is with Brasserie de la Senne, the brewery opened by Bernard Leboucq and saison historian Yvan de Baets. Many of the beers produced by Brasserie de la Senne show the influence of Yvan's labouriously researched essay on the history of saison brewing, which describes the practice of blending old and young beer, pointing out that lambic was often purchased for just this purpose. Given this background, and the close proximity of the Cantillon brewery, it should be no surprise that Brasserie de la Senne released a number of beers made in this way. Sadly its been a while since the last one was produced (and I've never tried any of them), but perhaps the brewery's upcoming to move to a larger facility will provide new opportunities for making this kind of beer. You can see the same combination of heavily hopped beer and lambic in another Belgian example of bière de coupage, the beers made by Chris Vandewalle at Seizoensbrouwerij Vandewalle. Vandewalle, like Yvan de Baets, has an active interest in the history of Belgian beer, one that shapes the beers he brews today. Vandewalle's Oud Bruin is made by blending together young and old beer made at the brewery, but more interesting for our purposes is the Bitter Blonde a Lambic, which is made by blending Reninge Bitter Blonde with lambic from Oud Beersel. Reninge Bitter Blond is probably somewhat close to the historical saisons and bières de garde made in the region. It has a beautiful orange hue, reminiscent perhaps of old beers that underwent a four or five hour boil in copper kettles, and at 7% ABV it is certainly strong enough for long-term ageing. The beer hopped primarily with English-type varieties grown in Belgium, and is strikingly bitter. It is open-cooled, and then open-fermented after yeast is pitched in a U-shaped trough re-purposed from cheese-making. After the krausen drops, the beer is cold-conditioned for three or four months prior to packaging. The bottle I drank was about a year old, and had a definite brettanomyces funk to it, reminding me strongly of this C19th IPA recipe that underwent a secondary fermentation by brettanomyces clausenii. As with Brasserie de la Senne and Seizoensbrouwerij Vandewalle, its no accident that Brouwerij De Ranke makes beers using this old process. A key part of their brewing philosophy involves "respecting old traditional methods, without ignoring new techniques", and when I asked Nino about the background for this beer he mentioned the tradition of ageing porter in oak vats, with its counterparts in the Oud Bruins and Flanders Reds of Belgium, along with the lambic brewers and blenders of the Pajottenland. "Our beer is a mix of these 3 styles: we live between the two oud bruin regions and are big lovers of real lambic." Nino describes the base beer for Cuvée De Ranke as "a very simple amber coloured beer with moderate bitterness (30 IBUs) that ages for a year minimum in stainless steel tanks or barrels". Interestingly, he also told me that this base beer undergoes a mixed fermentation, though I'm not sure if this includes LAB or just brettanomyces. This base is blended with 30% Girardin lambic prior to bottling, and aged further at the brewery before release: "after the blending the bacteria and wild yeasts of the lambic find new residual sugars in our beer and create a new fermentation/evolution, it's like lambic take's over within 4 to 6 month." Production time for cuvée is at minimum 18 months, and for Kriek (the same beers aged on Cherries) it is 24 months. I am not clear on whether any extra sugar is added for priming, but the process Nino described certainly sounds similar to the process used by Chris at Seizoensbrouwerij Vandewalle, and (as we'll see) it marks a difference between these beers and some American versions made in a similar way. Del Borgo's Duchessa, a spelt saison, is a lovely beer in its own right and well worth seeking out. The spelt gives the beer a full and fluffy mouthfeel, along with a slightly savoury note in the taste, and the bottles I've had have all had a quite remarkable fruity character that reminded me of apricots. I haven't been able to find out much about the process used to make this beer, but I'll update this section as I learn more. Duchessic is a blend of the same beer with 20% lambic. The original release was made with lambic from the Cantillon brewery, and aged for a year before sale. 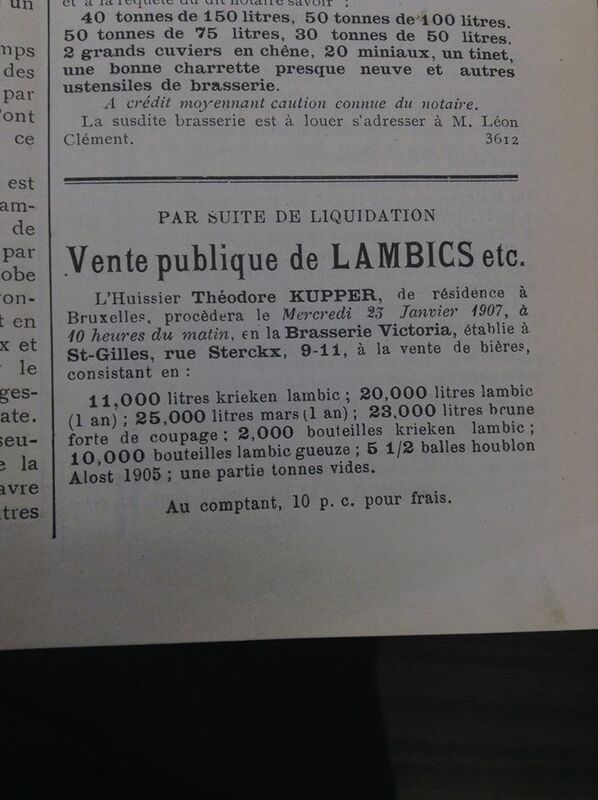 I do not know whether more recent blends also use Cantillon lambic, but even if they do, I suspect that the recent sale of Del Borgo to AB-InBev will mean that any future versions of this beer will source their lambic from elsewhere. The bottles of Duchessic that I have tried have all been excellent, with a quite pronounced lemony sourness and a soft funk. The beer is slightly thinner than the basic spelt saison, and often quite highly carbonated. Del Ducato's Nuovo Mattina is a spiced saison, and the pepper, ginger, and chamomile were all very apparent in the bottle I tried, with the spices giving the beer an almost numbing quality. While I wouldn't say they were overdone, I've never had a spiced beer that I've really loved, and this beer didn't make me a convert. Beersel Mattina, on the other hand, was something quite special. The original batch was made with lambic from Drie Fonteinen, purchased after the failed thermostat destroyed large quantities of Armand's stock. These days the beer is made with lambic from Oud Beersel, which makes up 18% of the final blend. As with other European bières de coupage, the blending is done at packaging, and the beer continues to age at the brewery for up to twelve months before sale. The bottle I had was fantastic: a similar lemony sourness to Duchessic, but balanced here by a fruity funk that had a distinctive 'berry' character. The spices receded into the background, and were barely apparent in the finish of the beer, adding some nice complexity (I don't think I would have picked them out if I hadn't tried the clean version immediately prior to drinking this bottle). Several other breweries have released versions of their beer blended with lambic—Burning Sky from the U.K., and Hill Farmstead being two favourites of mine—but I have never tried those particular beers, so I won't write about them here. I will, however, update this section as I try any other notable blends. As modern breweries start to come back to the idea of bière de coupage, several have started to make blends using their own sour beers. This is naturally an excellent option for breweries outside of Europe, for whom the purchase of aged lambic would be prohibitively expensive. One brewery that has led the way in the renaissance of this technique is Jester King, who use it in a number of their beers. The most prominent example is Das Wunderkind, a saison that is made by blending aged sour beer with hoppy young beer. The brewery is quite forthcoming with information about their beers, and have already published the recipe for the base beer in this blend. This aged saison has been released in the past as Das Uberkind, and is also used as a base for their second-fermentation fruit beers. As far as I know, unlike the European breweries described above, Jester King tends to blend beers that are already very dry and basically done with fermentation. This means that, though their beers certainly continue to evolve in the bottle, they are not relying on a further fermentation of the original beers for carbonation. Garret Crowell told me that they "look for a nice level of acidity in the older beer", and mentioned that this can be a good use for a beer that has become overly acidic: "if a barrel-aged beer is too sour, it can be blended with non-sour beer to balance it". The brewery generally uses about 10-12% aged sour beer in their blends, though they have used as much as 25% in the Dichotomous series. Crowell says that the blended component is often subtle at the rates they use, "but over time, further subtle fermentation takes place and can increase acidity". He adds that "the most apparent evolution is the increased presence of brettanomyces". For Das Wunderkind, the brewery blends in 2 oak barrels of aged beer (118 gallons), ranging between anything from eight to twenty four months old, with 30 bbls (930 gallons) of freshly-fermented hoppy beer. This blend is then dry-hopped, cold-crashed for a week, and then packaged. The hop character resulting from the combination of young fresh beer and dry-hopping is one of the most striking features of Das Wunderkind. Although it is not a uniquely American practice, the resulting beer shares something of its flavour-profile with my favourite American mixed-ferment saisons, beers like Jolly Pumpkin's Bam Biere or Crooked Stave's Vieille Saison. Once you become familiar with the concept of bière de coupage, it becomes apparent that quite a few American breweries are making beers with this process, especially as sour beers gain in popularity. For instance, 20% of Goose Island's Sofie is aged in wine barrels with brettanomyces and citrus before being blended back into the base beer. (I've been trying to find out more about their process, and will update this post when I do.) What's more, a number of brewers who spent time working at Goose Island have gone on to deploy the technique in their own beers. John Laffler of Off Color uses it in their gose Troublesome, which is a blend of a kettle-soured acid beer and a "really boring" wheat beer. Brian Taylor, who is head brewer at an exciting new Chicago brewery called Whiner Beer Company, will be using it in one of their first releases, a saison called Le Tub that will include some lactobacillus-fermented acid beer aged in wine barrels.